Lake Braies, known as the “Pearl among Dolomite lakes”, is located in a unique position in the Braies Dolomites. 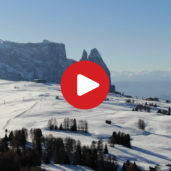 A place, unparalleled in its beauty, that became a set for one of the most popular Italian Television series in the last 5 years… a delightful blend of natural attractions, historical events and legends that have made this jewel of the Dolomites such a popular destination. Welcome to the Lago di Braies lake! Welcome to Lake Braies, known as the “Pearl among Dolomite lakes”! Idyllic atmosphere at the emerald green lake in the eponymous Valle di Braies valley. The surrounding mountain peaks are reflected in the clear waters of Lake Braies. The lake is situated in the northern part of the Fanes-Sennes-Braies Nature Park. A boat rental offers rowing boats for a romantic boat trip. It is open daily from mid-June to the end of September. The Our Lady of Sorrows Chapel was built as private chapel of the lake hotel. 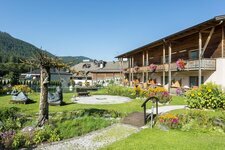 An entertaining and diverse cycling experience in the Val Pusteria Valley. 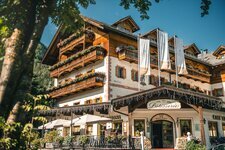 We cycle from Valdaora to Lake Braies where we enjoy the beauty of the eastern part of South Tyrol: picturesque villages, high mountains, dense forests and maybe the most beautiful lake found in the Dolomites. 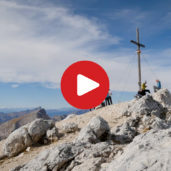 With an altitude of 2810m, the Croda del Becco Summit is a unique gem found in the heart of the Dolomites. This, diversified mountain tour, however, is not for the faint-hearted but the magnificent views that can be seen from the summit are well worth the effort. The Alpine wild lake of Braies, with its emerald-green waters, is something you can’t miss during your visit here, as well as the village of Prato Piazza. Stories and legends tell us about this valley and its special locations. Follow us in our trip to discover this magic area. 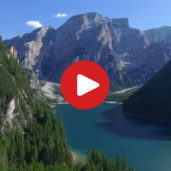 Two special lakes are the focal point of this relatively long albeit comfortable mountain tour in the expansive Fanes-Senes-Braies Nature Park: Lake Braies, situated at an altitude of 1500m as well as Lake Colli Alti at 2250m asl. A moody night at Braies Lake, one of the most beautiful lakes in the Dolomites and around the Alps, taken in a time-lapse video. Lake Braies, known as “Pearl of the Dolomite lakes”, is situated in a unique landscape in the heart of the Braies Dolomites. Its greenish and bluish waters attract many visitors. But it is more than a natural spectacle: it is a paradise for children and…a movie set! Enjoy Lake Braies from above! It is Europe‘s largest high-altitude alpine pasture, the Alpe di Siusi. We have looked at its snow-covered mountain peaks from a bird‘s eye view. The panorama is amazing and the landscape is one of the most beautiful of the whole Dolomites. The origin of Lake Braies - “Pragser Wildsee” in German, “Lago di Braies” in Italian - is referable to a reservoir dam, consequence of a mudflow. It is situated at almost 1,500 m a.s.l. in the beautiful Valle di Braies, a side valley of the Val Pusteria valley. In the mythological world Lake Braies has got an important role to play. According to legends, at the south end of the lake, where Mt. Croda del Becco (2,810 m a.s.l.) is situated, there was the gate to the Fanes underworld. That gate could be reached only with a boat ride. This is also why the Ladin name of the Croda del Becco is “Sass dla Porta”, which means “Gate Mountain”. Lake Braies is starting point for numerous hiking tours as well as for the Dolomite High Route no. 1. The surrounding mountains offer a splendid view on the “Pearl among Dolomite lakes”, considered to be the most beautiful South Tyrolean lake. If you prefer pleasant walks, you can walk round Lake Braies (4 km). And during a romantic rowing boat trip you can enjoy the beauty of the fairytale-like scenery - but only savages will dare to jump into the cool waters. The emerald green lake has become famous in the last years by the Italian television series “Un passo dal cielo” (One step from heaven) and is nowadays a centre of tourism. In order to protect nature in the Fanes-Senes-Braies Nature Park and due to traffic jams, in high summer the street from the locality of Ferrara to the lake is closed from 10.30 am to 2 pm. A bus as well as a shuttle service starting from Monguelfo will take you to Lake Braies - alternatively the hiking path no. 1 leads from Ferrara in a 1.5-hour walk to the lake.